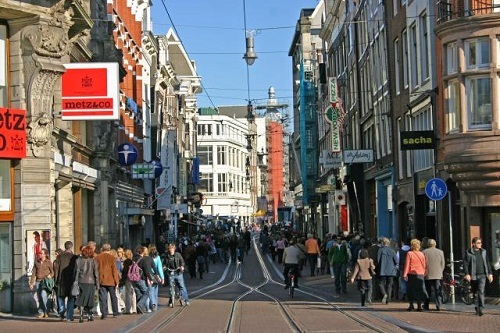 A lot of shopping in Amsterdam is not concentrated in plazas or malls, but shopping streets. 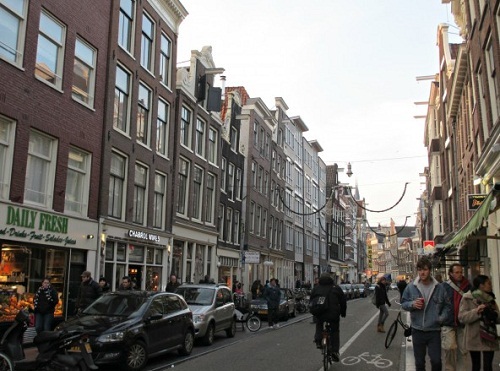 In this section we highlight a few of the best Amsterdam shopping streets. For every shopping street we mention why you should go there, how to get there and a bit of history. Street is translated to Dutch as “straat”. 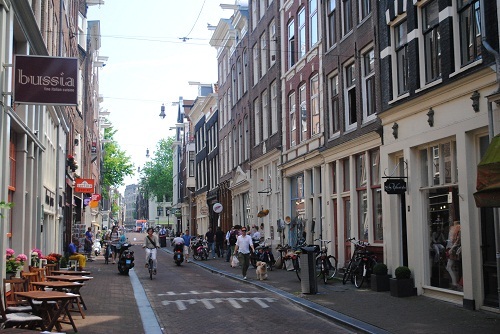 The Kalverstraat is one of the best known shopping streets in Amsterdam. This kilometer long street starts at the Dam Square and ends at the Munt tower. 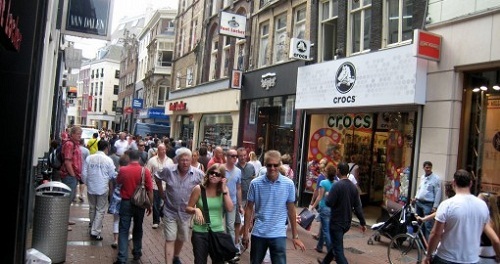 There are over 150 shops in the popular Kalverstraat. It is a middle class shopping street with a few more expensive shops. Many different large department stores are on the Kalverstraat. The majority is aimed at fashion with shops like H&M, footlockers, DIESEL, Esprit, Guess, Mexx, Nike and Levi’s. This is just a small sample, the street is perfect for fashion shopping. A nice feature of the Kalverstraat is shopping center the Kalvertoren, which packs the lunch room with a view named Blue. Talking about lunch, the Kalverstraat has many food options like La Place, Marks & Spencer, McDonald’s and the local favorite, Bakkerij Bart. Kalverstraat is “Calf street” in english. 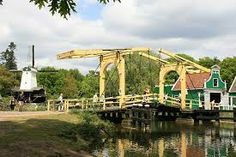 It is named after a calf’s market that was held way back in the 17th century. The Kalverstraat is the most expensive street in the Dutch version of the Monopoly board game. 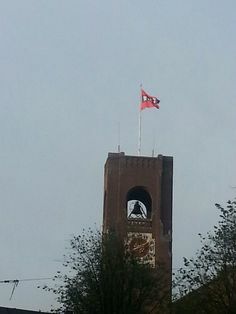 More information on the Kalverstaat here. 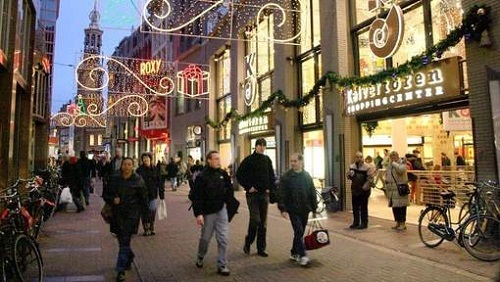 The Haarlemmerstraat was awarded of all best shopping streets in the Netherlands, which is no surprise. This street is packed with self owned boutiques that offer a broad range of lifestyle, fashion and interior decoration and products. 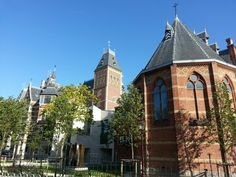 You will find no large retail chains in the Haarlemmerstraat, with the exception of course of the Albert Heijn supermarket. It’s a more neighborly street then Kalverstraat and Leidsestraat even though it thrives off that typical Amsterdam cosmopolitan touch. 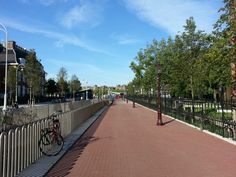 The Haarlemmerstraat becomes the Haarlemmerdijk at the Prinsengracht crossing. It is generally seen as one street. There are more than 235 stores in this shopping street. 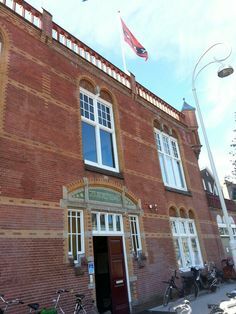 One of the best features of the Haarlemmerdijk is The Movies, a cinema in a historical building which has quality movies on display. There are also many lunch and diner options. 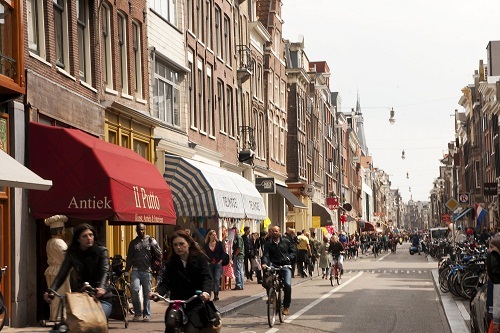 If you’re looking for a more trendy and alternative shopping street, Haarlemmerstraat is the place to go. The 9 Straatjes (“9 little streets”) are the connecting streets between the canals that make up the famous canal ring. This makes for a special atmosphere, and the shops are as special as you would expect. What you will find most in the 9 Straatjes are nice little boutiques with self designed clothing and accessories. The shops are quite trendy, but in a relaxed kind of way. There are also many bars where you can have a drink in typical Amsterdam surroundings. The 9 straatjes also has a few high quality fashion boutiques such as Filippa K and Björn Borg. It is a unique shopping center in the world because of it’s great location. Wander from street to street over the canals to visit all the great little shops of the 9 little shopping streets. The Leidsestraat starts at the Koningsplein and ends at the Leidseplein. Even this street has lost some of it’s shine, it’s still one of Amsterdam’s great shopping streets. There are unique shops in the Leidsestraat you will not find anywhere else. 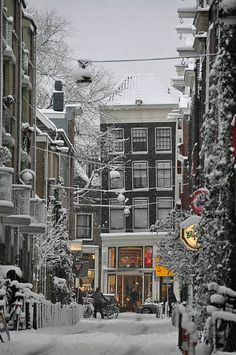 It is also the best single shopping street that crosses the major canals of Amsterdam. What about one of the largest flagship stores of Abercrombie & Fitch. This popular brand opened in Amsterdam only in 2012, but the visit is definitely worth it. Expect a large collection, bigger than in the rest of Europe with a possible exception for London. The most famous cosmetics brand from The Netherlands is probably Rituals. Find their store in the Leidsestraat. Especially the bathing foam is unrivalled. Just a teaspoon of this stuff will make the bubbles rise to the ceiling. Take trams 1, 2 and 5 at Central Station to go to the Leidsestraat.